Chelsea interim boss Guus Hiddink includes Kasey Palmer and Tammy Abraham in his squad for the trip to Liverpool on Wednesday night. 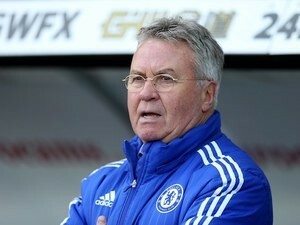 Chelsea interim manager Guus Hiddink has included two academy players in his first-team squad for the trip to Liverpool. Since their 3-2 defeat to Sunderland at the weekend, Chelsea have been dealt a double injury blow with Branislav Ivanovic and Diego Costa both being ruled out of the fixture at Anfield, while John Terry also begins a two-match suspension. That has resulted in midfielder Kasey Palmer and attacker Tammy Abraham being drafted into the group who have travelled to Merseyside for the club's penultimate fixture of the campaign. The pair recently helped Chelsea successfully defend the UEFA Youth League title but they are yet to make their debut in the senior setup. 'Controlled explosion' to take place at OT?